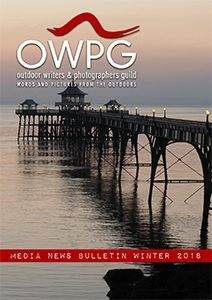 The Awards for Excellence 2018 have been launched by the Outdoor Writers and Photographers’ Guild (OWPG). If you are interested in joining the OWPG prior to applying for an award then click on the link below to see how to apply. Membership is open to professionals involved in the outdoors, whether it is writing, filming, blogging, publishing, walking, hiking, rock climbing and everything in between. The closing date for Award submissions is 31st May 2018. 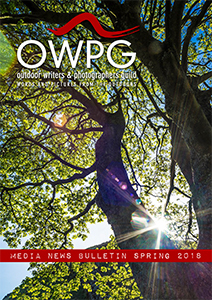 TGO turns 40 this year and the OWPG send our very best wishes to all those who have been part of this magazine over the years from editors and staff to contributors and of course, those who read it. OWPG has many long-standing and current contributors to TGO amongst its membership including Vivienne Crow, John Gilham, Hanna Lindon, David Lintern, Fiona Barltrop and Ronald Turnbull. To celebrate this milestone, the team at TGO have compiled a list of the 40 best mountains and OWPG members have contributed to this list. The souvenir edition of the magazine includes their words and photos on their own personal favourites. The top 40 include 25 in Scotland, seven in England and eight in Wales. Ben Nevis and Snowdon are included but Scafell pipped it’s higher neighbour Scafell Pike to the post in England. Here’s to the next 40 years for TGO and its continued success. In this issue of Outdoor Focus you’ll find a heartfelt tribute to Octavia Hill by Kev Reynolds, the pressures and pleasures of shooting a tough hill race in the Lake District by Jon Sparks, Roly Smith’s Book Reviews, and coverage of this year’s OWPG AGM weekend at Newlands including details of the winners of the coveted OWPG Awards for excellence. To read OF in a web browser click here (requires Flash). You can also download a PDF version of OF – to read offline on PCs, tablets or smartphones – by clicking here. The OWPG has just celebrated its annual Awards and AGM weekend, this year held in the Lake District. Based at Newlands Activity Centre in the Newlands valley, highlights included a visit to Lanercost Priory/Hadrian’s Wall with OWPG member/Hadrian’s Wall expert Mark Richards, a walk exploring the benefits of the Viewranger GPS mobile app with Associate Member Viewranger, a practical video workshop with OWPG member/video expert Andrew White, a scrambly walk over Causey Pike in strong winds, kayaking on Derwent Water and of course our Annual Dinner and Awards Presentation, where the OWPG’s Golden Eagle Award, Derryck Draper Award and OWPG Members Awards are presented. For more information on the awards please see our Awards Page. In this issue of Outdoor Focus, you’ll find tributes to Walt Unsworth and Nick Channer, two prolific writers and steadfast champions of the outdoors who have sadly passed away. You can also read about the The Man from Alaska and his friendship with Kev Reynolds; Andrew White talks about Walks around Britain and the challenges and joys of making a TV series; and Ronald Turnbull celebrates the Lake District and its World Heritage status. We were saddened to hear that Nick Channer, a Guild member for more than 20 years and a former Committee member, died last July following a short illness. Destiny decreed that Nick would write about the history of the countryside and intriguing houses. He was born at Home Farm Cottage in the grounds of Elstree boys school at Woolhampton, Berkshire, where his father was a teacher and his mother the assistant matron. The school, an old Georgian manor house surrounded by parkland, almost certainly kindled Nick’s love of walking and the countryside; it belonged to a former age and, surely, was the inspiration for his life’s work. Beautiful countryside and intriguing waterways lay beyond the school gates, as well as places like Mapledurham, featured in Nick’s book Writers’ Houses. Nick was an only child, and as a youngster he spent hours at an old typewriter, creating his own stories from the programme synopses in Radio Times. Visits to his cousins in Wolverhampton gave him the opportunity to tour Pebble Mill studios, leading to a lifetime fascination with the place. The family moved to Thatcham, near Newbury, when Nick started at secondary school. Then, after leaving school, he had a couple of office jobs before finding work with an estate agent and writing in his spare time. Later, inspired by Sunday walks with his old school friend Ian Knapp, Nick began writing local walking guides for Countryside Books in Newbury. Nick steadily broadened his repertoire, and retraced fictional journeys such as Richard Hannay’s possible route across Scotland in The Thirty-Nine Steps. He branched out on several overseas forays, covering topics as varied as the D-Day landings and Sherlock Holmes’ fateful trip to Switzerland. He wrote regularly for the AA Pub Guide and the Reading Chronicle, and contributed to broadcasts on national and local radio. Besides writing over 50 books, Nick wrote extensively for newspapers and magazines including The Daily Telegraph, Country Walking and Country Life. Meanwhile,The Guardian featured extracts from his magnum opus Writers’ Houses, with its foreword by Julian Fellowes. He travelled widely, talking about his books to clubs and societies like the WI. True to his character, Nick coped with terminal illness by not talking about it. Eventually, in May, he had confided in his cousin Anne that he was being treated for cancer, but his death in July came as a massive shock to us all. Nick will be greatly missed by all who knew him, but his legacy lives on in his writing.